There are Amazon affiliate links in this post. That means if you buy something from that link, I will earn a small commission, but it won’t cost you anything additional. It takes very little yarn and not a whole lot of time to make these wash cloths. Use a nice cotton yarn in the color of your choice. For this gift I went with neutral colors. ch 3, 12 dc in first ch, join with sl stitch in first dc. ch 2 (1 dc in next stitch, 2 dc in the next stitch) around. Join with sl stitch in first dc. 12 times, sc in the next ch, hdc in the last ch; ch 1, turn. Hdc in the first hdc, (dc in the next sc, sc in the next dc) 12 times, dc in the next sc, hdc in the last hdc; ch 1, turn. Hdc in the first hdc, (sc in the next dc, dc in the next sc) 12 times, sc in the next dc, hdc in the last hdc; ch 1, turn. (Repeat rows 2 and 3) 11 times; do not ch 1 at the end of row 25. Row 26: Sl st in each st across. Fasten off. Thank you so much for sharing your beautiful patterns. Your instructions were easy to follow. 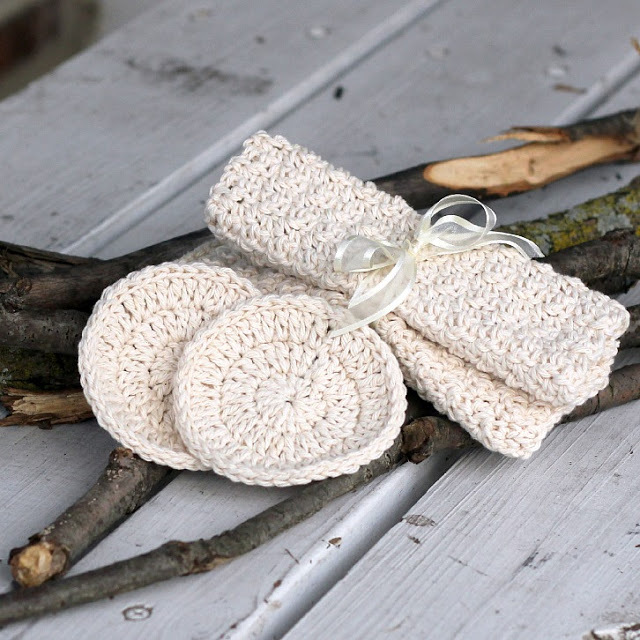 I made the wash cloths as a gift for my niece, I know she will enjoy receiving these beautiful cloths. What a wonderful joy it is to use the gifts God gives us to bless others. Thank you again. Thank you for the pattern. These are lovely and I will be including these with my crochet chemo caps for women that I make for gift bags distributed by Phil’s Friends in Chicago. 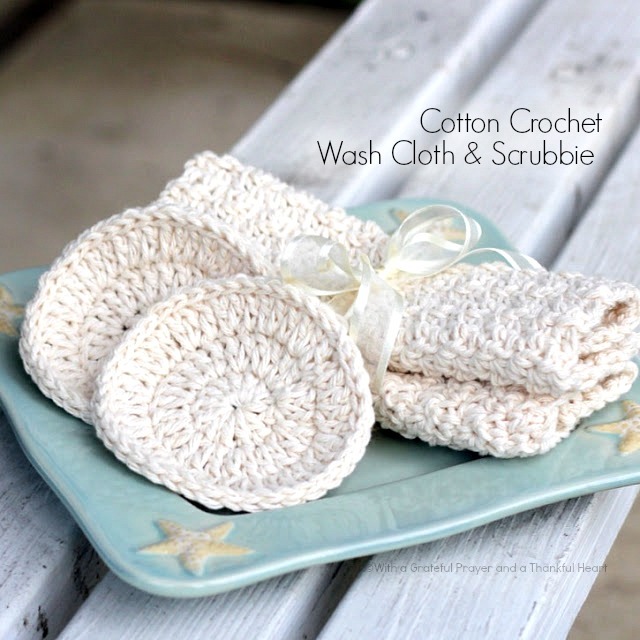 I adore the texture of the washcloth! However, I would love to know what the name of the stitch is, if there is a name??? Just curious… I’ve googled “name of crochet stitch hdc, sc in next, dc in next,” BUT I’ve found nothing that fits. Only thing I found is combining all 3 into the same stitch, which isn’t this pattern at all. Lol. I’m compiling my own stitch dictionary, just to help inspire me when my creative juices aren’t flowing, ya know? So if you (or anyone reading) knows the name of this glorious stitch, PLEASE do tell! Thanks for sharing! Really wished you had named the yarn. These looks so exquisite! These are so lovely! Just setting off for a quiet (with 2 kids) weekend in Italy and I'm taking these two projects with me with the intention of relaxing in front of the hotel fire and crocheting!! Hi, I found you on CrochetSpot. Love your ideas, so lovely and simple. Definitely will make anyone feel special. : ) Hope you'll stop by my decorating blog. These are soooo cute! Thank you for the patterns. Thanks for sharing! What a neat idea! Blessings! What a sweet idea – and so very personal. What woman wouldn't feel pampered by this? She's a very lucky girl to have such a talented and thoughtful Mom! Thanks for sharing those. Great gift idea. Beautiful gifts. I would have a hard time using them and just display them in the bathroom! Yes, Suzanne, I am completing the gift with the display dish and special soaps. These could easily be made by knitting your favorite pattern into a square. I have made knitted kitchen cloths before.